Washoe Meadows State Park is open year-round. Hike through the park during the warmer months and snowshoe and cross-country ski in the snowy ones. Angora Creek and the Upper Truckee River run through Washoe Meadows State Park, so much of the park’s terrain is moist and home to many varieties of wildflowers throughout the spring and summer. Since there is so much water in and around Washoe Meadows State Park, it’s a great location for birding. The park offers sweeping views of Freel Peak, Mount Tallac, Angora Peak, and nearby Twin Peaks. Hiking through the park is about as flat as it gets at Lake Tahoe, so this location is perfect for young children and elderly adults. Just keep in mind that since it is a meadow, large sections of the park can be submerged underwater early in the spring and summer (based on the previous winter’s snowfall). And a fun fact about the park is that scenes for Top Gun 2: Maverick, starring Tom Cruise, were filmed in December 2018 near this route’s turnaround point. Click on the above map to enlarge it for printing and better viewing. This map is only for reference and shows the general route along Washoe Meadows State Park. Always carry a traditional topographic map and compass when traveling in the backcountry. Park at the Forest Service gate located on Lake Tahoe Blvd 2.5 miles west of the “Y” intersection of Highway 50 & State Route 89 in South Lake Tahoe. The gate is just beyond Tahoe Mountain Road and near the Lake Valley Fire District Station, and it’s set about 100 meters back from the road in the trees. An optional entry point to the park is on Mountain Meadow Drive. However, I recommend just parking at the main gate on the north side of Washoe Meadows State Park since it’s never busy and the location enables you to hike the full three miles of trail to the derelict structure/turnaround point. I only offer this secondary location and the alternate trails that form a loop (on the map) so as to alleviate any confusion when hiking if you happen to wander off the main trail. The trailhead to the Washoe Meadows State Park is between Tahoe Mountain Road and the Lake Valley Fire District Station, tucked back in the trees on the south side of Lake Tahoe Boulevard. Here’s a map to assist you in finding the parking area for accessing Washoe Meadows State Park. Remember, the hike featured on this post begins on the northern end of the park. Begin your hike through Washoe Meadows State Park at the trailhead on Lake Tahoe Boulevard, between Tahoe Mountain Road and the Lake Valley Fire District Station. This hiking trail is relatively straightforward compared to other similarly less traveled trails at Lake Tahoe. It’s easy to follow and generally comprised of a hard-packed sandy walkway occasionally lined with granite rocks. Just stick to the main thoroughfare and you’ll easily make your way to the turnaround point while hiking alternatively in and out of meadows and forested areas. Along the way you’ll be able to read a handful of interpretive signs, cross a couple of foot bridges, and hopefully spot a wide variety of Sierra Nevada wildflowers and birds. I can’t emphasize enough, however, that this park is best saved for hiking during the heart of summer and fall. Although there are some beautiful wooden bridges that will help to keep your feet dry, ultimately this park is a meadow and many of the lower portions of the trail can be completely submerged underwater during April, May, and even June, depending on how much snow Tahoe received the prior winter. Although I have you arbitrarily turning around for this route at the derelict wooden structure located 1.5 miles from the trailhead (set back in the trees), you could continue south exploring other sections of the park. One example of an extended route through this park is to follow the same trail I feature on the Cross-Country Skiing at Washoe Meadows State Park blog. When Lake Tahoe experiences a big snow winter, Washoe Meadows State Park is an excellent place to cross-country ski or snowshoe. It’s an ideal location for beginner cross-country skiers since the terrain is mostly flat. 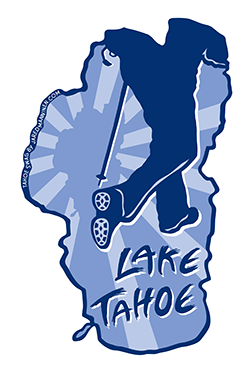 However, the overall snowpack definitely needs to be of significant quantities because the park is basically located at lake level, which means it’s at the lowest point in the Lake Tahoe Basin and is slow to accumulate snow. Read the aforementioned article for more specific information regarding cross-country skiing and snowshoeing through the park. For those of you who are interested, here is a poster available for purchase that I designed featuring an image taken in Washoe Meadows State Park on January 25, 2017. Click on the image of the poster to go see all of the types of prints available at my RedBubble. Thanks for your support! Click the image to view available prints of this poster.